The Magic FrogPad™ is easy to install. The all new, Magic FrogPad™ fits the Apple® Magic Trackpad perfectly. FrogPad™ has redesigned its revolutionary FrogPad2™ architecture to fit on a single, clear, repositionable cling. The touch sensitivity is powered by a simple software that turns your Apple® Magic TrackPad into a Magic FrogPad™. Functionality can easily be interchanged between mouse & keyboard by simply sliding your finger across the FrogMouse Key. You don't need your QWERTY keyboard anymore. 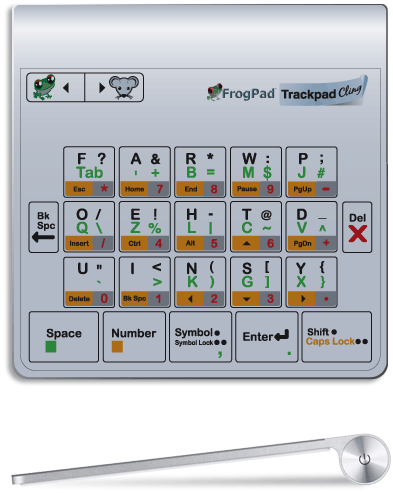 Magic FrogPad™ can take over the functionality of both keyboard and mouse with one simple cling. Get FrogPad's one-handed data entry freedom on your Apple® Magic Trackpad today. You don't need your QWERTY keyboard anymore. It's two devices in one! The Magic FrogPad™ is available in both left and right-handed versions. It connects via Bluetooth® wireless technology. You can still use a mouse or work in conjunction with one. Magic FrogPad™ gives you a smaller footprint to control what is on your computer's desktop while leaving plenty of room on your physical desktop.